This morning, I had a craving for cold brew coffee except I didn’t feel like getting a babysitter for Bull (our very large pitbull) to make a trip to Trader Joe’s. After searching the web, there were two main recipes which sounded doable. The only bad thing about this plan was waiting at least 12 hours for coffee. Either way, I was pot committed, poker term meaning, you’ve already invested too much to turn back. You might ask, if you have a coffee maker which can make hot coffee in 5 minutes, why wait 12 hours and spend all this energy for cold brew. The reasoning is the flavor of cold brew is smoother since it is less acidic than coffee fewer with hot water and because I love coffee. It also stays fresh for 5 days in the fridge if I don’t drink it all on day 1. You can make a batch of cold brew on Sunday while you are prepping everything else. Portion the cold brew with almond or coconut milk and honey into individual mason jars so you can grab and go during the week. Add 2/3 cup of coffee and two 16.9 oz water bottles to a pitcher or mason jar. It’s best if you freshly grind the coffee, it’s not a big deal if you don’t. Mix coffee grounds into water until it’s all wet. Cover and let sit on the counter for 12 – 18 hours. Put coffee filter in strainer over a bowl and slowly pour coffee through. Clean pitcher and pour strained coffee back into the pitcher. *Original ratio from the Noshon.it was 1/3 cup coarse ground coffee to 1.5 cups water, you can multiply based on the size of the container. Put everything in your favorite kickass mug, microwave for about 1 minute or so depending on how hot you like your coffee. Then use a blender or frother to mix, this makes it like a super creamy, frothy latte. I’m the laziest cook EVER so of course I found a couple shortcuts. If you have a French Press, you can use that to steep your coffee on the counter, DON’T PUSH THE PLUNGER DOWN until you are ready to strain the coffee into the pitcher you are storing in the fridge. 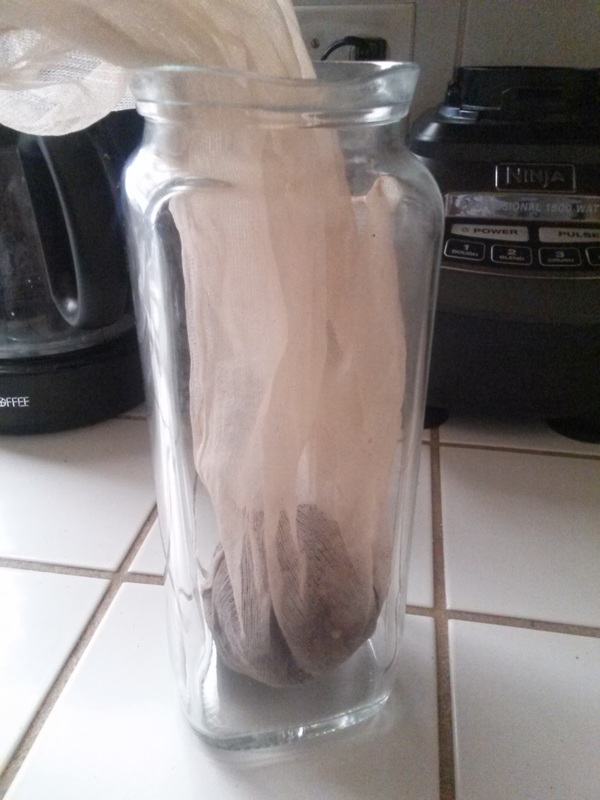 If you have a nut milk bag, you can put the coffee grounds into the bag, place that into your pitcher or mason jar and then pour your water over. Eleven hours or so later, you can pull the nut milk bag out and then set the pitcher in the fridge. 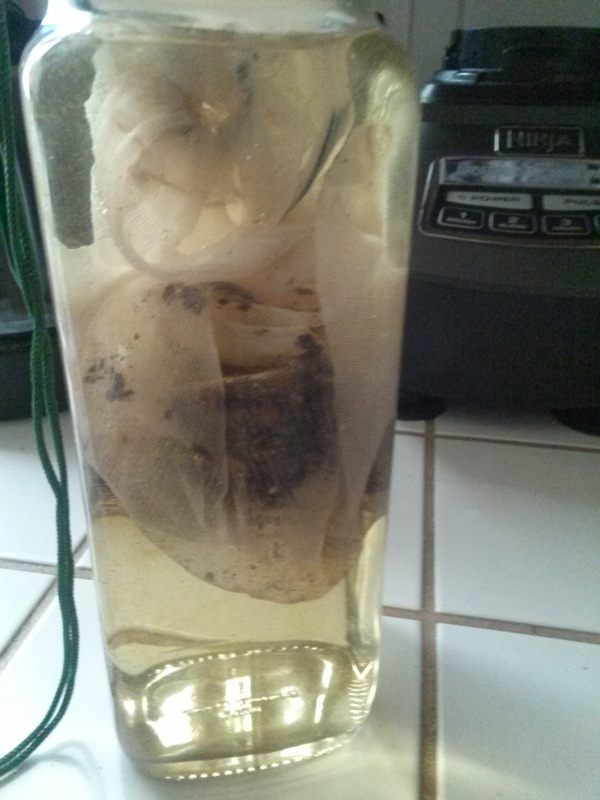 Put the coffee grounds into the nut milk bag, then place in the pitcher or mason jar. Add water to the pitcher and let it steep on the counter for about 11 hours. 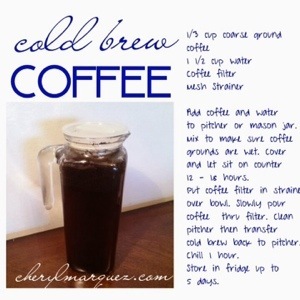 Let me know which of these methods you’ve used to make your own cold brew, enjoy!